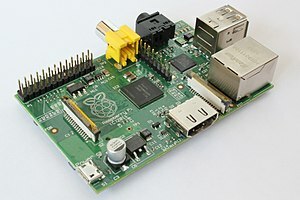 The Raspberry Pi single board computer is a low cost yet a powerful hardware with ethernet, USB, audio, video and HDMI. Although it has many interesting features, there are some limitations when you need to drive relays, motors or LEDs for example. The Raspberry Pi has several GPIOs that can be utilised. However its voltage range is between 0-3.3V and has a maximum sinking current of 16mA. You need higher current than this to drive the relay coil. For input signals from devices such as analogue sensors, its output voltage range may be too low or high to be connected directly to Raspberry Pi's GPIO. The audio output from this board is adequate to drive small earphone speakers. You will require an amplifier to drive higher wattage speakers. Now, there may be many different requirements from users. We can customise the expansion board to suit to your requirements. Just tell us the peripherals/devices that you intend to connect to Raspberry Pi board so we can help to custom design the PCB for you. Check out here an example of an expansion board that we have tailor made. Interested? Contact us.